Tarazona has been called Mudejar City; it's unique in that the streets are laid out in tiers above the Queiles River quays. Because it was built at the foot of the Moncayo Mountain, there was little flat land to build upon anyway. The kings of Aragon lived here once. The Romans, as in most places in Spain, predated them. Today you can stroll the medieval streets fronted with tall facades in the barrios of the town. Tarazona's Gothic cathedral, started in the 12th century and completed in the 16th century, is its primary attraction. Despite the fact that it was completed well into the Catholic period of Spain, the Mujedar style is still very clearly present in the cathedral's belfry and lantern tower. 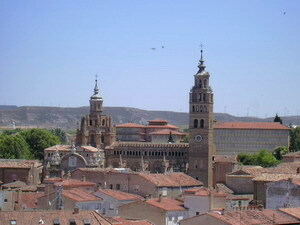 Its dome is quite similar to that of the Zaragoza cathedral. You can also visit the Ayuntamiento, or Town Hall, with its reliefs of Ferdinand and Isabella as they conquered Granada together. This monument is on the Plaza de Espana on a hill overlooking the river, and if you pause here for a few moments, you can experience its marvelous view. The Ruta Turistica from here will take you to Santa Magdalena church, which has yet another Mujedar tower; this tower is the primary landmark of the skyline, and can be seen for miles. The mirador of the church has a panoramic view. At the top of the hill is La Concepcion, another tower-blessed church. Tarazona also, until the expulsion of the Jews in 1492, had a vibrant Jewish population in the old part of town. Today, little remains that is recognizable. The alleys are fronted with Moorish and Spanish buildings, and some, called "hanging houses," are built on top of natural rock formations, beneath which are caves once used by Tarazona's Jewish population. In the center of the old section of town is a large ruined building with an ornate medieval door that researchers think once was a Talmud Torah with a mikveh in the basement; a Jewish group is working right now to fully restore this house and convert it into a museum devoted to the Jews of Tarazona. Another particularly interesting feature of Tarazona is the octagonal bullring, with its walls formed by houses that are still lived in today. The Brujas de Becquer is a half-mile southeast of Tarazona, on the road to Zaragoza. This hotel is modern and unpretentious, but it's comfortable and neat and quite adequate for most, with private showers. In the dining room, you can take advantage of an excellent fixed-price meal. The food of Tarazona is known for its almost austere plainness; this has been tempered lately by chefs who have brought an elegance to their cooking. Today, the food is still simple, but made of the freshest ingredients, and with subtle touches that give it a sophistication the food of Tarazona never had before. El Galeon is a good example. They serve primarily Tarazona food, with their specialties being a simple stew and custard desert. Jakob Jelling is the founder of Eurotomic.com. Please visit www.eurotomic.com/spain.php if you're planning a trip to Spain.